The world had not fully recovered from the horror of World War I or the anguish of its catastrophic aftermath, the Great Depression, before an even greater war commenced. The Third Reich of Adolf Hitler threatened to dominate all of Europe and, as the physicist Albert Einstein rushed to bring to the attention of President Franklin Roosevelt, the limitless destructive power of the atom was well within the reach of Nazi Germany. 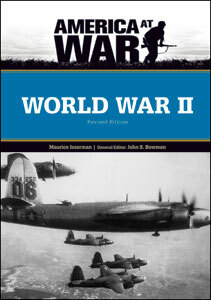 World War II, Revised Edition presents the complete story of America's war in Europe and in the Pacific, from Pearl Harbor to the Normandy invasion to the Japanese surrender aboard the USS Missouri. Vivid photographs, illustrations, and maps, along with helpful research features, make this book an invaluable addition to any classroom or library. Also included in this new edition is a chapter devoted to the military innovations seen during this massive war. Full-color and black-and-white photographs and illustrations. Full-color maps. Sidebars. Glossary. Further reading. Index. Maurice Isserman holds both a Ph.D. and a master's degree from the University of Rochester. He is a professor of history at Hamilton College, specializing in 20th-century U.S. history and the history of exploration. Isserman was a Fulbright distinguished lecturer at Moscow State University in 1997 and has received numerous other grants, awards, and fellowships. He has written dozens of articles, reviews, reference book entries, and book chapters, and he is the author of more than a dozen books, including Facts On File's Journey to Freedom: The African-American Great Migration and two other titles in Chelsea House's America at War set.